If you want to be a true outdoor enthusiast, you should start early! Outdoor shoes for kids ensure step security on any terrain and any occasion at all times. Whether on a hiking trip, trekking, sledding or just as a tough shoe for everyday use, outdoor shoes for kids are perfectly adapted to the anatomical conditions of feet during their growth. In terms of quality, high-end shoes for kids are just as excellent as their counterparts for adults! Lace up the kids' shoes and the outdoor adventure can begin! Which features are a must for outdoor shoes for kids? Only the best for the little ones! When choosing the right outdoor shoes for kids you should keep your expectations high. But what do high-end shoes for kids have to provide? First and foremost outdoor shoes for kids should be comfortable to wear and, of course, not too heavy. That way, the shoes for kids will not become a burden after wearing them for a long time and even long hikes are no match for them! Furthermore, high-end shoes for kids should provide a perfect fit for small feet. Good outdoor shoes for kids have a stabilizing footbed which keeps the foot in a perfect position and supports it at all times. What is especially important for kids' shoes is, of course, the sole. High-end outdoor shoes for kids come with tough, grippy, cushioning soles that provide sure footing on any terrain. Whether it is on icy terrain, mud or boulders, good outdoor shoes for kids will get the little ones safely through it! Of course, the outdoor shoes for kids should provide a strong lacing system as well. Now, all that is left to find out is for which purpose you need the shoes for kids. Which outdoor shoes for kids are there? 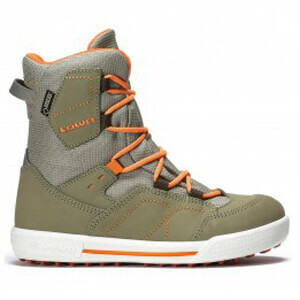 For the perfect outdoor adventure you need suitable kids' shoes that are fitting the occasion. If the little ones are out there sledding in freezing temperatures, winter shoes for kids should be your outdoor kids' shoes of choice. Moisture-repellent outer material as well as being insulated inside will keep the feet pleasantly dry and warm. Prepared for the snow! For longer distances, hikes or school trips hiking shoes are the right shoes for kids. These outdoor shoes for kids are stable, lightweight and comfortable to wear and make sure that the small feet do not complain even after really long hikes. Of course there are many other high-end outdoor shoes for kids on offer. Whether you are looking for outdoor sandals, approach shoes for the little climbing enthusiasts or slippers, there are the right shoes for kids for any occasion. Once you find the right outdoor shoes for kids, your outdoor tour is sure to be a great success - for the little ones as well as for their feet!